Even though your dog does not mean to harm or scare you, their biting at clothing behavior must be stopped before it becomes dangerous. 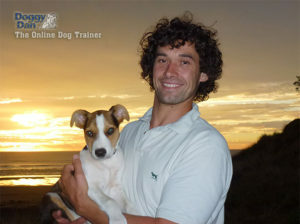 Doggy Dan the online dog trainer has graciously provided DoggySavvy.com with today’s free audio lesson. This training lesson is all about how to stop a mouthing puppy, which is a typical issue for puppies from 8 weeks old up to 8 months or older. Some people have year old dogs that are still running around like little puppies mouthing, nipping and biting you, and having a bit of fun. It can be a very frustrating problem if you don’t know what you’re doing, or you don’t know why they are doing it. Little puppies have very sharp little teeth, and can unintentionally terrify young children and even adults if the puppy likes to mouth and bite people. When the dogs gets older their mouthing and biting problems can become a lot more serious and a lot more scary. The good news is that this method of stopping your puppy’s mouthing behavior absolutely works. Dogs mouth each other during normal interaction and is fine. We are not trying to stop this kind of healthy mouthing. The redirect is when you move them from mouthing your ankle, or your fingers, or your hands, or your clothes etc, onto something else. You see, it’s no good trying to stop your dog from mouthing completely. They won’t stop mouthing, they need to mouth. In the wild all the little puppies are mouthing, biting, and having fun. It’s very natural, and in fact it actually needs to happen. So, what you want your puppy to learn is they are allowed to mouth toys, and in fact other dogs will allow them to mouth them. But we don’t want your puppy to be mouthing humans. So, the redirect is when you take an object such as a chew toy and you put it near your puppy’s mouth and you give them that. The object that you are trying to redirect them onto must be something that they enjoy. So many people make the mistake of simply buying the first dog chew toy they see, or the cheapest one. Typically it will be some rock solid hard plastic toy that their dog may have no interest in at all. Here’s one little trick, if you are having a little trouble getting your puppy’s attention. You can put a very fine smear of something like a meaty paste onto the object so that it actually get’s their attention. If your dog or puppy has unwanted biting/chewing on some particular things in your home (i.e. shoes, chair legs, curtain tassels) then try to mimic that feel in the redirection object that you give them. For example, to redirect away from your curtain tassels you could create a tassel toy for your puppy out of woolen yarn. To redirect your dog away from chewing on wooden chair legs you could give them some natural untreated wood to chew. At different stages of life your dog will want different textured chew toys. These toys can be very inexpensive or even free. An old wet tea towel with a knot tied in it is probably one of the most popular little puppy chew toys. Pieces of rope, pine cones, egg boxes with a little biscuit inside can be great as well. Some examples of chew toys that you can use to redirect your puppy’s mouthing onto. Different dogs have different tastes in toys they like to chew, so you may need to try a few before you find the right one. When you call your puppy over, make sure you have something to give them to mouth and chew. As humans we talk and shake hands and cuddle, but puppies use their mouths to interact with others. So when you are cuddling your puppy, they will immediately turn their head around and try to mouth you. They are just trying to be affectionate, but we don’t want them to mouth you. When your puppy mouths you, you can make a little noise like an “Ouch” or “Ow”. But, don’t go overboard. Because if you just keep making a big noise and showing lots of energy your puppy will become even more excited when they know they got your response. So instead, try making no noise at all, staying calm and silent. Then take the thing you want the puppy to be redirected onto and simply put that in their mouth. So, have a chew toy ready for them when you call them over, then you can put it in their mouth. Then, as you’re cuddling them, they can chew away on that and you can both be happy. Well that’s the redirect, it’s very simple. 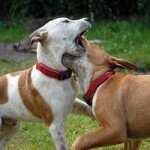 Focus your dog’s mouthing on something else rather than try to stop them from mouthing completely. Want free training from a real, professional dog trainer? Watch Doggy Dan’s lightening-fast video series and develop the kind of relationship with your dog you always dream of. 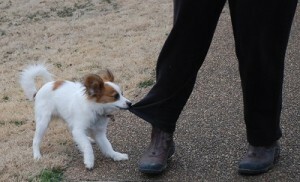 Even little dogs can be a big nuisance if they are not trained. If anyone is bitten, the owner could face a lawsuit and the dog would be destroyed. 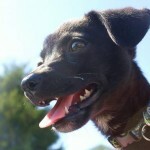 What to do if you try the redirect, but your puppy keeps coming back at you? If your dog thinks that they are more important than you, in other words, if they start climbing that power ladder and think they are the pack leader and in charge then you will find that they will keep coming back at you. This is all part of the nature of dogs. They instinctively try to be the best they can, to win these little games, to challenge you, to outwit you, to see if you’re strong enough, smart enough, and clever enough. You have to understand how to show your puppy that you are in charge. This has nothing to do with growling, shouting, hitting or being aggressive. It’s about understanding dog psychology. Because the more your puppy thinks they are in charge, the more excited they get, the more they will challenge you, the more they will mouth and bite and grab your clothes, and the less they will respect you. 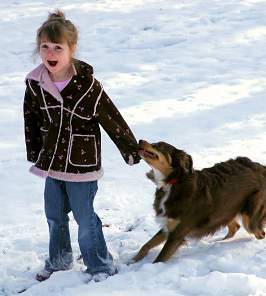 Showing your dog that you are the pack leader is foundational. Even puppies have sharp teeth, so it’s best to train them not to mouth people from an early age. If you have a puppy that is still mouthing and biting you after redirecting, then you should discipline them by using a timeout. Put them somewhere safe, like a laundry or bathroom, where they will be alone and there’s not much fun. Not the garden, that’s way too fun. You can let them back out once they have calmed down. The reason your dog still nips or mouths you isn’t that they hate you, it’s just that they realize they have the upper hand. There’s not enough respect there for you. They know they are winning, they are in charge and they are showing you what to do and ignoring what you’re requesting. The key to stopping this, the missing piece, is that foundation. The ability to get your dog to understand that you are the pack leader. If you put this foundation in place, then you will be dealing with a much calmer dog throughout all your training. Failure to establish this relationship will result in a dog that is far more determined and excited who will keep coming back to challenge you and to mouth and bite you. If you feel like you a struggling with your dog’s mouthing problems, then look at the cause of the problem instead of just the symptoms. Visit Doggy Dan’s Online Dog Trainer for a ton more useful information about mouthing puppies and lots of other dog behavioral issues including the foundation of being the pack leader. You’ll be blown away by the content and when you start putting the simple techniques in place you’ll start seeing your dog or puppy transform. That will transform the relationship you have with your dog for the better, and will truly enrich your life. When you have the information you need and you put it in place really amazing things can happen. If you have an aggressive dog, a dog that suffers from separation anxiety, a dog that jumps, toilet training problems, they don’t come when called, you name it the information is all there on Doggy Dan. There is even a complete puppy training video diary that document how Dan raised his puppy Moses. They start with Moses being picked up from the rescue center at 8 weeks old. The series covers all the important videos of how Dan stopped Moses from crying at night, how he integrated him with other dogs, and all that sort of stuff Moses needed to grow into a wonderful dog. So get started today, because these issues don’t sort themselves out, they don’t self-correct, they generally get worse and worse. And of course, Doggy Dan will teach you that all important foundation of being the pack leader.